Located in Red Bank and at the foot of Signal Mountain, Erlanger North does much more than bring hospital services back the community – it brings advanced, highly specialized services close to home. This comes in the form of the highest level of 24/7 emergency care north of the river and the region’s top sports medicine specialists. Add an accredited sleep disorders center, nuclear medicine, non-invasive cardiac care and family medicine – and the reasons to drive long distances for care are easy to forget. 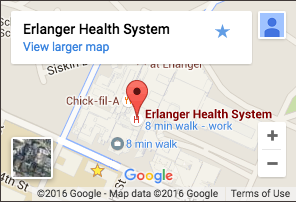 Erlanger North is conveniently located to serve the Red Bank, Signal Mountain, Hixson, North Shore, Soddy Daisy, and Dunlap communities.